The Bible is revelation, so we’re told. The word of God, the mind of God, can be discovered in its pages. Holy men of old—tuned in to God—put pen to paper (well, whatever they used at the time) and created a monumental record of the Almighty’s outreach to humankind. Nelson-Pallmeyer saw that faith could be corrupted by the Bible, “…whenever we fail to discern the difference between distortions and revelation.” But, alas, he didn’t go on to tell us how to do that, because, of course, there is no way to tell—and ‘trusting the holy spirit’ is perhaps the most feeble epistemology imaginable. 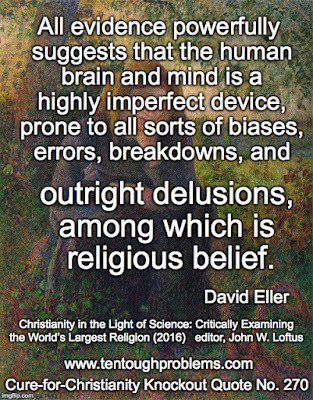 Now, so many years after my seminary experience, David Eller sheds valuable light on the problematic role of the human brain, in his essay, “The Mind Is a Terrible Thing: How Evolved Cognitive Biases Lead to Religion (and Other Mental Errors)” in John Loftus’ most recent anthology, Christianity in the Light of Science: Critically Examining the World’s Largest Religion (2016). There is so much in our heads that garbles almost everything, and Eller brings home this point with full force in this essay. As a young seminarian I was skeptical that the 3-4 pound lump of tissue in our skulls was capable of channeling communication from a deity. Just how would that work? And how could we be sure that the divine message was free from distortion? That was really naïve: distortion in what our brains do best. Eller notes that our brains come with a lot of evolutionary baggage, i.e., their reptilian and mammalian frameworks are still intact. While most religious folks don’t put their faith under close scrutiny, atheists commonly assume that their own views are evidence-based, anchored to rational thinking. But not so fast. Our brains are not any better that their brains, and Eller’s essay provides a handy guide to the pitfalls that we all face. Thus the heart of the essay is a detailed description of four categories of cognitive biases that our brains leave all of us liable to. Eller concludes, “Our evolved history has left us with a thinking organ of unparalleled power and of frustrating fragility. We can use it to great advantage, but we must use it carefully and always be chaste about what it thinks it knows.” The implications for religion are profound, and should give religionists pause, more so—I dare say—than atheists. We are not making elaborate claims, based on the wispiest epistemologies, about beings that can’t be shown to even exist. When you’re out on that kind of limb, obviously you should be wondering if the mind might be playing tricks. 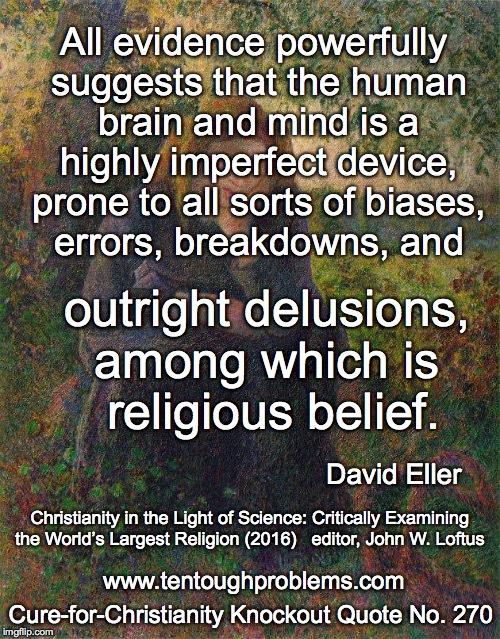 I recommend, by the way, reading Eller’s essay in conjunction with the one by Valerie Tarico, “Christian Belief through the Lens of Cognitive Science” in Loftus’ first anthology (2010), The Christian Delusion: Why Faith Fails.